Last night was going to be a session at Seaford beach but the wind dropping as it did, it meant that there would be little in the way of any surf, so a change of plan saw me opting to go to Brighton Marina instead. The Tackle Box had no fresh lugworm but a visit to The Peacehaven Angler secured some quality worm for the evening. Just before I was setting off, I got a call from Eddy at The Tackle Box to say that a customer had cancelled their order and there was two packs of worm on offer. I got onto the East arm by 7.30pm, an hour and a half after high water and got myself a space up at bay 31. I set up a rod with feathers to get some mackerel for the bass and another rod was set up with a size 4 two hook sole rig baited with worm and cast out about fifty yards. While that rod did its work, I set about getting some mackerel which didn’t seem to be that abundant. It was a beautiful evening to be out – warm, with absolutely no breeze, slightly overcast sky and an oily calm sea. Suddenly, out of the corner of my eye, I saw the worm rod pull down, I struck and the first fish of the evening was soon on the deck – a bream of around 20cm which went straight back. Another one was added to the tally a short while later. In the mean time, I managed half a dozen mackerel which was enough for the session. While taking the feathers off and setting up the bass rod, I saw the other rod making the movements that meant the dreaded weed. I decided to bring it in before the weed built up too much and was soon dragging a heavy weight in. As it got near the base of the wall, I felt the ‘weed’ pulling back in jerking bursts and instead of the expected ball of crap, I saw a lovely lobster flapping away. It was carefully hauled up the wall and was soon in its new home – a bucket. Normally they get themselves tangled up in the line but this one was fairly hooked in the mouth parts after dining on the presented worm. They are usually found in the craggy parts near the wall base not out in the open fifty yards out. If I caught nothing else during night, I wouldn’t be bothered as Anna and I would be having a beautiful dinner anyway. A few more bream were brought in but they were all in the 20cm bracket, so got their freedom. 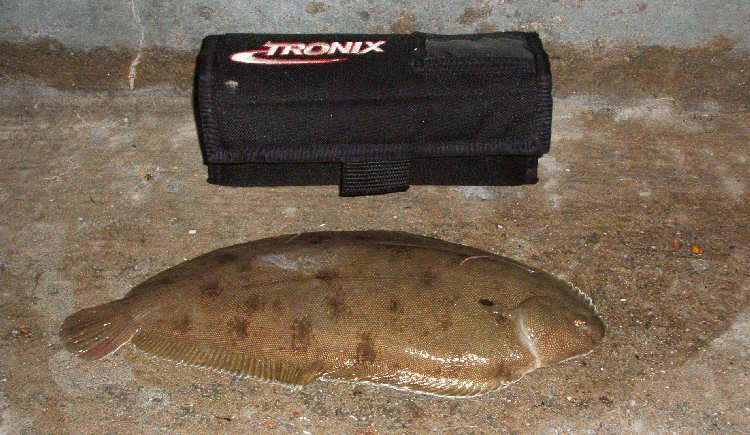 A break from the bream came in the shape of a small thornback ray just as darkness fell, this was followed by two schoolie bass in quick succession before it all went quiet for a long period. The bass baits remained untouched apart from nibbling by whatever micro beasties were lurking in the vicinity. All chances of a decent bass were blown when a group set up not far down from me and proceeded to make more noise than a noisy thing and insisted on lighting up the whole area like blackpool with unnecessarily bright lights, shining them everywhere and on to the water about them and me. With this in mind, I packed up bassing and continued with the sole rig which brought in a few more small bream. While awaiting the next capture, I busied myself, changing the water in the lobster bucket and generally sorting through kit and making sure all rubbish was put away in a bag. I suppose it was half an hour later, when I retrieved to re-bait and noticed that there was a fish on, I was well pleased when I saw that it was a nice plump sole of 28cm – oh what a lunch we were going to have! Apart from the noise and light show along from me, it was a deathly quiet night and at times I could hear what seemed to be the noise of a Dolphin or Porpoise surfacing some way off, a slosh and whoosh sort of sound. Fish-wise, a couple more schoolie bass fell to the worm bait, along with one small ‘Bootlace’ eel and another small thornback. By 3am, things had died down and no more bites were coming, so it was with thoughts of a decent lunch, and happy at having had a good night’s fishing, I packed up and headed for home. 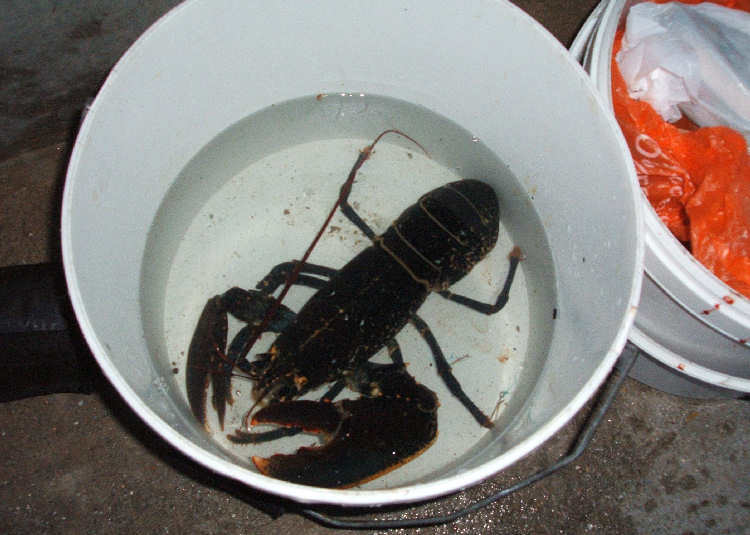 Once home, I put an air pump in the lobster bucket to keep it aerated and tucked it into the fridge along with the sole.